SmartShare User Load Balancing™ is a patented technology that is integrated into all SmartShare Systems products. This technology automatically allocates bandwidth so that all users have the optimal speed on the internet. Imagine an IT roundabout that makes all traffic flow smoothly without any queues or slow response times – this is the philosophy behind User Load Balancing. The technology identifies the number of users, analyzes their behavior and allocates a suitable amount of bandwidth based on the individual’s needs. In today’s business networks, there are constant smaller or larger data transfers between users and internet services or servers. The internet was originally designed to allocate bandwidth per flow, which means a user who establishes many flows will get more bandwidth than a user who uses fewer sessions. For example, three users are downloading data from the internet on a shared 1,5 Mbit/s internet connection using a traditional Cisco router. Altogether, the three users are downloading 10 flows with 10 Mbit of data. 1,5 Mbit/s/10 flows = 0,15 Mbit/s per flow. User A downloads 1 flow (1 Mbit) and gets 0,15 Mbit/s. User B downloads 1 flow (1 Mbit) and gets 0,15 Mbit/s. User C downloads 8 flows (8 Mbit) and gets 1,2 Mbit/s. User A and B will each have 10% of the internet bandwidth, but user C downloads 8 flows and gets 80% of the bandwidth. Regardless of the amount of downlaoded flows each user will have their data transfers completed after exactly 10 seconds. Let us make the same calculations again, but this time with a SmartShare added to the network. Three users are downloading data from the internet on a shared 1,5 Mbit/s internet connection.Altogether, the three users are downloading 10 flows with 10 Mbit of data. 1,5 Mbit/s/3 users = 0,5 Mbit/s per user. User A downloads 1 flow and gets 0,5 Mbit/s. User B downloads 1 flow and gets 0,5 Mbit/s. User C downloads 8 flows and gets 0,5 Mbit/s. 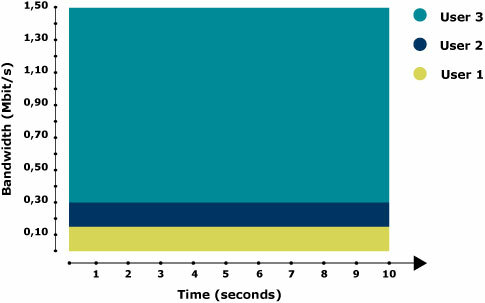 The 1/3 of the bandwidth each user gets in this example, is a guaranteed minimum of bandwidth. ”Unused” bandwidth will be evenly distributed to the remaining active users. 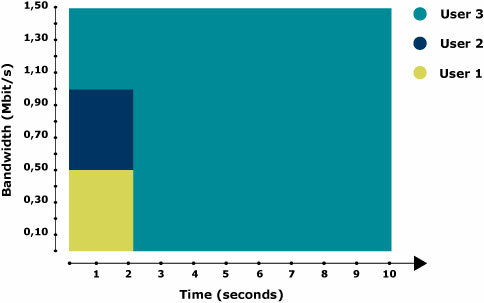 The users are transferring the same amount of data as in the previous example, but user A and B are already done after two seconds. User C now has the use of of the entire bandwidth, and finishes his job in the same amount of time as in the previous example and does not experience a slower transfer! 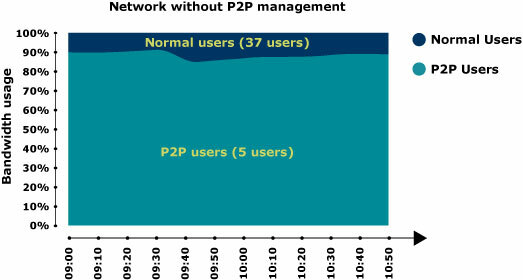 The growth of peer-to-peer traffic (P2P) causes a major problem for operators and companies of all sizes. SmartShare Systems has a unique approach to this problem, which – unlike many other products – is 100% effective. P2P applications are a problem because they are very “greedy” for network resources. They use various techniques, such as opening very large numbers of flows and “diguising” as other applications.This results in them taking far more than their fair share of the available bandwidth in the network. Measurements by service providers show that 70% or more of total bandwidth can be taken by these applications, even though less than 5% of users are using them. The simplest way to ensure fair network usage is basically to use SmartShare products. They all have User Load Balancing™ enabled and with this facility, all users will receive an equal share of network bandwidth, regardless of the number of flows they have. A user who is downloading a legitimate video at one address, and a neighbor who has a greedy P2P application, will receive exactly the same share of the network. 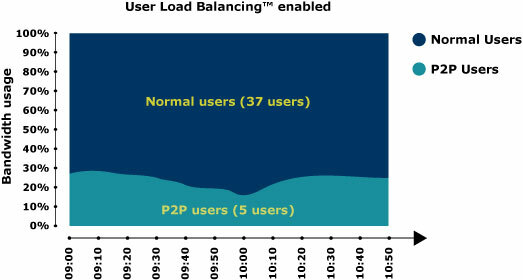 The graph above shows a SmartShare product with User Load Balancing™ enforcing fairness between P2P and normal users. This is much better than today’s situation, where the P2P user will typically get 10 or more times the bandwidth of the legitimate user. The SmartShare products do this without any configuration commands. No complex policy setting and no updating of signature files is needed.